This is my conversation with a small business owner who isn’t ready to disclose their business’ identity for this article. This is meant to give you a fly in the wall view into the minds of how a business consultant thinks vs. how an entrepreneur thinks and operates. Any lessons you take away are your own, framed by your mind and context, and not the intention of this article. A: That is what I trained for and I really enjoy beauty works. After my training I worked for others first but I guess I got tired of working for others and my husband supported me to start my own. Q: … but how did you know people would come and the investment was going to pay off? A: I don’t understand what you are asking. People always need haircut. Q: How did you know this was the right thing to do? A: You just know. I had the skills. I am very good at it. So I knew I can do this too. Q: So about your price, how did you set it? A: I saw how high priced the place I worked before charged. People are afraid of such high prices, most of them, mostly men, come once and they are gone. There are too many $8-$10 places around here that give bad haircuts. So I set a price that will not look too cheap or too high. A: That is easy. Most places charge similar price for extras, you simply add for each extra and set a price. Q: And do you know how your different packages are doing … are customers taking up these over simple haircut? A: Mostly people come just for haircut. Q: You have 3 other people working for you but I see them mostly idle, why? A: People ask for me all the time for appointment. I am working non-stop. People call and book appointments weeks in advance for me. Others, they will get busy soon, if not they move on. Q: If you are in such high demand why do you charge the same price for all 4? Shouldn’t you charge a higher price than the other 3? A: This is crazy. How can I tell customers it is $18 for one and $23 for another. They will be confused and will not like it. They will see me as greedy. Q: Why would they? Don’t they see more value with your skills and seek after you? You are simply charging for that value. A: It is too complex. What if I lose business because I am too expensive? Q: You might lose a few. But don’t you cover that from higher profit from others, from sales to your employees, more free time for you to run the business or enjoy with family? Q: Do you keep track of how occupied 4 of you are? Say for 50 hour week, how many hours is each one busy and what is the sales per person? A: I think it is in the computer when we ring up. But what will I do with it? Q: Finally, you recently raised your prices. Why and how did you know to do it? A: I didn’t want to raise. My rents went up. I had to manage the increase. We didn’t want to be seen as greedy. I still wanted my price to be below $20 because that is the magic number. After $20 people think it is expensive. So we decided to increase to just below $20. and still cover our rent increase. Taking on the small guys for their pricing? Can you believe that drycleaner charging twice as much for a woman’s shirt as they do for men’s shirt? Isn’t it atrocious that the local diner is charging $5 for eggs that cost them cents? What $20 for the umbrella? How greedy can this street vendor get, gouging customers when it is raining? It’s a ripoff! You probably made similar statements about different small-business. What am I saying, you don’t stiff the small businesses you only heard your friends make such statements. What is the big deal here? As long as one has options why should anyone complain about pricing? If one is complaining about pricing isn’t it likely one is not the customer the small business has in mind? Granted the small business owner got her pricing wrong and most likely doing markup pricing with fixed cost allocation but that does not mean one can express outrage at the pricing. Any price, however the business arrived at it, is not fleecing, rip-off, gouging or despicable. And it should not matter to a customer what it costs them to deliver the product, you pay for value. I wrote the same line for business owners – a business’ costs are just that, not something they can pass on to their customers. Same works here for customers. So what they charge $5 for eggs they got for free? If the customers perceive value in consuming those at particular point in time and see that as better choice over all alternatives then it is fair pricing. If there is no value, you are not the target segment, so don’t blog about the atrocity. If one insists on demanding fair pricing that is based on what it costs the business to make one should pick on the big guys who are writing the book on profit maximization, not the small business owners. It was two Super Bowls ago I published this book, same time Groupon had their infamous Ad featuring Tibetian restaurant. Since their IPO a few months later their stock is hovering around $5 – far below its opening day pop but 150% growth over their 52-week lows. How do you make informed decision about whether or not a business should run Groupon promotion? Here is a chance to read this book for free, because you likely spent all the money on iPad and iPad mini. Or worse lost it buying high and selling low Groupon shares. Fill out this form and the first 50 people will get the book that sells for $9.99 for free. Even if you are not a small business owner you will find the chapters on demand curve and sales vs. marketing channel a refresher course for you. Surely you are not surprised by Groupon woes? Update 11/1/2012: Groupon valuation is back in news because of its rival LivingSocial’s woes. In Amazon’s 10-Q filing late Friday afternoon, it disclosed that Living Social saw revenue of $372 million for the nine-month period ended Sept. 30. While that is up 120% from the same period last year, it reflects third-quarter revenue of just $124 million – down 10% from the June period. When valuing a company’s stock it pays to understand what pressing customer needs it serves and what unique value it adds. That is assuming you are Benjamin Graham, Warren Buffett type investor who takes the time to understand the business before investing. Business model is value-creation and value share. A business that creates net new value for its customers gets to share in it. A business cannot get its share of value it did not help create, let alone grow exponentially. If you are such an investor then Groupon’s announcements about lax controls should not come as a surprise to you. I am not referring to the $2 drop in its stock today but the news that led to it. It is hard to describe Groupon’s business. In fact even Groupon is not clear about what it is. For starters, it is a two sided market. It essentially brings together small businesses on one side and end consumers on the other side. In general a two sided market adds value by unlocking value, creating new value or removing inefficiencies. It then gets its fair share of the net new value added. A two sided market must be consistent in its positioning – it must serve as the enabler for the jobs the two sides are seeking to do. There should be no asymmetry. Take for example, eBay. It positions itself as the market place for buyers and sellers to find each other. No asymmetry here. EBay adds value by enabling transactions that otherwise would not have been possible. What about Groupon’s role as two sided market? What is its positioning to deal seekers? It tells them about, “one ridiculously huge coupon everyday” and its tag line is, “Collective Buying Power”. In other words it wants the deal seekers to hire it as a sales channel to buy products at steep discounts. What about its positioning to small businesses? 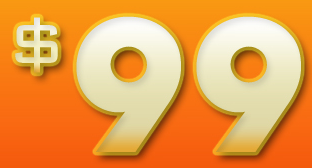 It tells them about, “guaranteed new customers”, “big exposure”, and “measurable marketing”. The story line goes, “these customers fall in love with your service and visit you again and again, paying full price”. In other words it wants the businesses to hire it as a marketing channel. That is asymmetry (to put it mildly) in its messaging. Groupon cannot be a sales channel to acquire ridiculously huge discount and a marketing channel to acquire valuable customers at the same time. What value does it add? Businesses bring value to the table in the form of 50% off discount. Deal seekers add no value but get 50% off. Groupon gets its share of 25% from the businesses. You bring a full pie. Give half of it to my email subscribers. Give half of what is left to me. Take home the rest and wait. It will not only grow to become a full pie, it will multiply into many full pies. To repurpose Omar Khayyam, “the deal seekers having scored a deal, move on. No level of customer service will bring them back to pay full price for your cupcake they can get for 50% with their next coupon in the bakery next door”. There is no net new value add. 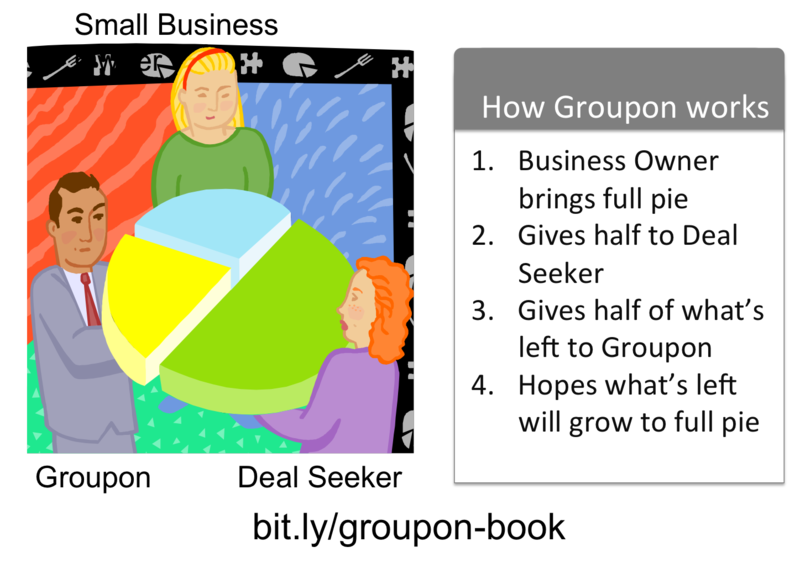 Just value distribution – from businesses to deal seekers and Groupon. Groupon cannot take its share of value it did not help create. So we have a business that most do not understand, even it does not have clarity on the needs it serves and adds no new value. How can you place a valuation on such a business? Surely you are not surprised that such a confused business finds itself again in the accounting hot water? There is a WSJ report that SEC may investigate Groupon. I see no reason for such an investigation at the expense of taxpayers. If irrational investors want to bet their money on a business they do not understand or chose not to understand, why should they be protected? Presenting item quantity information before price (70 songs for $29) may make the deal appear much more appealing than if the price were presented first ($29 for 70 songs). Through books and TED talks these academic reports seep into popular media and are presented as pricing lessons for businesses small and large, especially for startups. After all, these are peer reviewed research reports based on controlled experiments that found statistically significant difference, published in reputable journals and hence worthy of our trust? May be these are true, but what do they tell us about the customers and their needs? What job is your customer hiring your product for when they pay this cleverly presented price? The problem is these behavioral pricing tactics may just be statistical anomalies. Let me point you to a xkcd comic that so nicely makes the point I am about to make . After what xkcd has to say, anything I say below is redundant. Let us take the first research I quoted, “70 songs for $29 vs. $29 for 70 songs”. What could be wrong here? Well, why specifically 70 and 29? What other combinations did the researchers test and what are the outcomes? What about 60 for 25, 50 for 20 etc etc. Is it possible that they had tested 20 different combinations and found that just this one produced statistically significant difference? (Like the green jelly beans in xkcd comic?). Did the researchers stash away all the experiments that produced no results and published the one that produced this interesting result? An opinion piece in Business Strategy Review, published by London School of Economics, pretty much says this is the case with most research we read. The problem is that if you have collected a whole bunch of data and you don’t find anything or at least nothing really interesting and new, no journal is going to publish it. Because journals will only publish novel, interesting findings – and therefore researchers only bother to write up seemingly intriguing counterintuitive findings – the chance that what they eventually are publishing is BS unwittingly is vast. Pretty much we cannot trust any of the research we read. What are likely statistical flukes get published as interesting findings on pricing and find their way into books, TED talks and blogs. The rest don’t even leave researcher’s desk. Let alone academic journal, try writing a blog post that reports, “found no statistically significant difference”. Who will read that? What we are seeing is publication bias that is worse than any sampling bias or analysis bias and a prevalence of pricing parlor tricks presented as authoritative lessons in pricing for businesses. When it comes to pricing your product, be it pricing cupcakes or a webapp, you would do well to look past these parlor tricks and start with the basics. Pricing strategy starts with customer segments and their needs. You cannot serve all segments, you need to make choices. Choose the segments you can target and deliver them a product at a price they are willing to pay. As boring and dull as it may sound, that is pricing strategy. Your business will do well to start with the most boring and dull than chasing the latest parlor trick based on selective reporting. Everything else is distraction. May be these fine tunings have some effect but not before strategy. After you get your foundation right, then you can worry about what font to use in the sign board. How do you set your pricing? The Wall Street Journal interviewed Groupon CEO Mr. Andrew Mason about his IPO and his business. The Journal throws a whole bunch of softball questions to Groupon CEO Andrew Mason. Valuation – It is perfectly acceptable for a company to expect and set any valuation. It is up to the market to buy the shares at that price or not. Why question him on the valuation? and the Journal reporter lets it slide. Really? Questioning his maturity: This is an insulting question. Ask about his challenges and how he rounds up his gaps with an executive team. Asking, How important is profitability? : Really? Now who is being immature, excuse me, being unaware of the number one goal of any business? This question lets Mr. Mason talk about the growth, market share etc etc. What questions they should have asked instead? The question is how can you say more buying power to customers and more profits in the same sentence? Profit implies share of net new value created. What is the net new value created? The question here should have been – are you a sales channel to dispose of excess inventory without cannibalizing current full-priced sales or are you a marketing channel to acquire new full-price customers? What happens when Groupon turns into a daily habit? The title of this article is a quote by Mr. mason in the article. What would happen if customers are used to the “ridiculously large discount” they get from Groupon? What does this mean to the small businesses? The question should have been, is that a guarantee? hope? insurance? promise? What metrics are you providing to small businesses to measure that pay off? There is no data or assurance that deal seekers come back. Besides didn’t he just say, “we can turn Groupon into a daily habit for customers”? Why not buy a copy of this book and give it to all the small businesses before signing them up to do Groupon?